Dove Cottage, which sleeps 4, is a Grade II* curtilage listed cottage with an indoor heated swimming pool shared with other users of the Llanfendigaid site beside the sea at the southern end of the Snowdonia National Park. Could you please make it clear in your online information that any internet access is practically unavailable. Skype phones have not worked for years. This should be updated please. Had a good stay otherwise. Thanks. Hi Susan I am sorry the satellite broadband did not work well for you. It isn't bad when it is on form but is less reliable than I would like. As a result, we are in the (longwinded) process of installing ultra fast leased line technology with fibre optic linked directly to the main BT Colossus network backbone....and I expect it will be in by Sept at the latest at which point hopefully broadband performance issues will be a thing of the past! There are some really nice walks nearby, it is very tranquil nice to get away from all the hustle. Graham is always on hand with advice. On arrival we couldn’t find any TV instructions for the evening, there were 3 remote controls. Step by step instructions called for. The bathroom hot water tap was dripping, the shower waste was blocked and nearly overflowing, we reported everything and it was fixed on Monday while we were out. The lampshade at the top of the stairs needed replacing as the fabric had crumbled inside, it could only be seen when the light was on. The front small panel under the sink was broken. I did report the lampshade and the panel when we left by note, hopefully so that it could be fixed for the next occupants. Problems described were just an inconvenience but could have been avoidable with better preparation. Overall we were comfortable and enjoyed our stay in a beautiful setting. The weather was very good and we went out every day. The recommendations for restaurants were perfect. A very comfortable, well-maintained and well-appointed cottage in a peaceful and scenic location. Dove Cottage at Llanfendigaid Estate was the perfect rural getaway for my 10-year-old daughter and I. Booking was straightforward, marketing materials accurately reflected the property, amenities and location, and contacts on-site and via email/phone were friendly and responsive. It was a great base from which to explore the stunning surroundings, and partake in some of the many child-friendly activities in the vicinity. Spending the whole day relaxing at the cottage, using the indoor heated pool and walking locally, was just as enjoyable as venturing further afield by car or train. The cottage was warm, clean, comfortable and well-appointed. We very much hope to return one day! Fantastic cosey cottage in a great location. Fantastic views with a short walk to the beach wity plwnty of wildlife along thw route. A lovely, comfortable and tastefully furnished cottage taken as part of the whole Llanfendigaid Estate for a week. Perfect for two couples or a family of four either as part of the whole estate or individually. Spacious upstairs kitchen and living area. We had a wonderful holiday at Dove Cottage. It is well equipped, cosy and comfortable. The location is peaceful and the views superb. It is a bonus having a pool onsite too. There is loads to do in the surrounding area and we wo would love to come back in the future. We hired out the entire estate for a large party of us for a week over New Years. The accommodation was fantastic, with everything you needed and the manager of the Estate was incredibly helpful and attentive whenever we needed him during our stay. We would definitely recommend...and we would love to return! We stayed during October half term, we had a wonderful time, the cottage is very comfortable, the swimming pool was great, we had the pool to ourselves most of the time and there are plenty of inflatable toys for the children to have great fun with. There are great walks nearby and beaches which were recommend by Graham. A very relaxing holiday, would recommend. A lovely’s place , lovely walks and good restaurants within a drive away. Great for an escape and accommodation is warm and comfortable. We thoroughly enjoyed our stay at the Dove Cottage, it was cozy and just perfect for our family of 5. The onsite indoor swimming pool was a huge perk as well as the quiet peaceful countryside and close proximity to the beaches and beautiful views. The cottage was equipped with every amenity you can think of, even including books and board games! Excellent stay at Dove Cottage as always. Have used Llanfendigaid Estate, including Dove Cottage on numerous occasions and we are always very pleased with the condition. Any issues (usually problems caused by previous holidaymakers who have not reported it) are dealt with promptly by the Estate Manager, Graham. We went to Llanfendigaid with our grown up sons, daughter in law and two small grandchildren. We booked two cottages next to each other. The setting was perfect for us, and the children loved walking up the hills and playing on the tyre swing. We had BBQs and made good use of the (warm) swimming pool. The cottages are well equipped and comfortable. We slept really well and were able to share some great family meals round the big table at Dove Cottage. WiFi is limited, but we were able to buy extra if we needed it. Graham and Will were very welcoming and quick to respond to emails and phone calls. We felt well prepared for the visit with the pre-holiday information. There is plenty to do in the local area, visiting lakes, train rides, castles and beaches. We shall return to explore more of this wonderful place. A wonderful few days in Wales in a comfortable and well equipped cottage, the big bonus of this place is the pool!! Very comfortable cottage with nearly all the home comforts. Had a really enjoyable stay. Cottage location was good for visiting so many places in Wales whether the weather was fine or damp!! Would have no qualms about recommending it to friends. Dove Cottage, Llanfendigaid is a lovely little (but more spacious that expected) cottage with all the necessary home comforts, and then some...sea views, swimming pool, beautiful surroundings and well located to visit the surrounding area. It really does deserve its label as a premier cottage, it is so well kept, comfortable, and we certainly felt at home. My expectations were exceeded in terms of what was provided on the premises. The manager at the site is an absolute credit. We were aware he was about on a number of days, to be expected if the premises and estate are going to be maintained to such a high standard. He was always helpful and we never felt intruded upon. It was great location to take our young son on his first family holiday. He loved hunting pine cones and watching the birds that feed at the front of the stable block. We really couldn't find any faults and would love to return. We stayed for four nights in Dove Cottage (family of four) and had a great time. The cottage is perfectly situated, with virtually no passing traffic, and no noise etc. from the other nearby properties (including the large house). The pool was fab and we had exclusive use, though this may not be the case during peak holiday periods. The upstairs open-plan kitchen / diner / lounge is extremely comfortable with all the amenities we required, including some great board games. We also enjoyed the outside areas. Hopefully we will return in the future! Great place to stay. Kids loved the swimming pool. Graham was lovely, always making sure everything was OK.
Great walks in surrounding area and very close to beach. A beautiful cottage, very clean,warm and cosy. The kitchen was well equipped. The manager was very helpful and friendly on our arrival. The area is fabulous for walking, and with an conveniently timed trains from the nearby train station we walked the new Wales Coastal Path both up to Barmouth and down as far as Borth during our stay. We had a lovely half term break at Dove Cottage. The cottage was clean and well equipped with everything we wanted. Our children (aged 4 and 6) loved the indoor pool which was invaluable, especially on the odd wet day we had. The cottage is ideally situated with walks from the door into the hills behind the estate and also down to the stoney beach. It is also only 15 mins walk or a short drive to Tonfanau railway station which is on the coastal railway line with short journey times to Tywyn and Aberdovey south and Barmouth and Harlech north. The train was a great way to get around and see the coastline in this area, so having the station so close was very handy. All in all, a great place to stay to see this part of Wales. This was our first time in the area and we couldn't have chosen a better place to stay. Graham was very welcoming and helpful throughout our stay. We used the pool on site frequently and often had it to ourselves. Having the beach so close by was great and the farm tea shop up the road was superb with very friendly people. There was lots to do and we could have stayed longer. We have already recommended here to friends with similar aged children. Beautiful estate & cottage in a beautiful location! Outstanding! Simply perfect! Great family holiday away from normal life! Clean, cosy cottage, very helpful and friendly staff! Can't wait to go back. 10 out of 10! 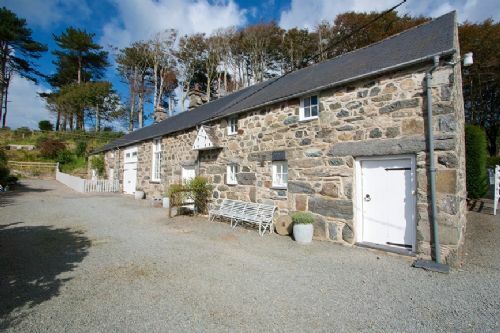 We booked dove cottage with the main house at Llanfendigaid estate for a hen do. The accommodation was brilliant.the cottage was really nice and well equipped for self catering. The views around the estate were amazing and the customer service we received was fantastic. We loved staying at Dove Cottage - very comfortable (especially the beds! ), warm and cosy, a great location and the swimming pool is a real bonus. There is fantastic walking (Cadair Idris) and biking nearby and the coast is also very close to explore. If the weather turns there are plenty of options - train to Harlech, Aberdyfi, the Tywyn cinema - and it was beautifully dark and quiet at night. We were lucky with the weather; we even managed a BBQ! Altogether we had a very restful stay, busy enjoying the hills or beach during the day and relaxing at night. The people who stayed in the cottage were happy with accommodation. They initially found it dark compared to the main house but slept well as a result of the bedroom being at the back. In Stable cottage we were disturbed by some nesting birds or squirrels! We stayed in Dove Cottage for a week over Easter, and found it to be a good base. This isn't really a luxury cottage, but it was comfortable, practical and clean, so we felt quickly at home. The surrounding scenery of farmland and hills provides a good backdrop, and the cottage really is visited by doves on a regular basis, befitting its name! The upstairs is an open plan kitchen / sitting / dining area, with plenty room, the double bedroom has a large bed and reasonable storage, and the twin bedroom was quite compact but comfortable. There is a roomy bathroom, with a bath and shower; the latter only just had enough water pressure. We used the free internet, which seemed to be reliable for email and standard surfing. The pool, which is just across the lane from the cottage, was warm, and very popular with the youngest member of our party. My husband and I were in Dove Cottage and thought it was lovely. The bed was both beautiful and comfortable. Most of our time was spent with the family in the big house. We enjoyed our stay at Dove cottage, but it could have been more comfotable with a little more attention to needs of holiday makers.The on-site manager was courteous and helpful. We left a short list of the improvements . A charming cottage in a good location. Overall a charming cottage in a good location and Graham made us feel very welcome. The heated pool was a little on the chilly side (even for the kids at the end of August) and we struggled to research the area once we arrived as the wifi only worked for the first day (we could have done this before we came but as it was a last minute booking we thought we'd do the detailed research once we arrived and picked a cottage with wifi for this purpose). But these are just small factors in an otherwise lovely old cottage on the edge of Snowdonia within good reach of some very beautiful areas of North Wales. Delightfully peaceful. The cottage is well equipped and comfortable. Although there are two other lets and a caravan club area in close proximity, none are intrusive. Plenty of pleasant walks in the area & the local station within easy reach for trips future afield. Really enjoyed our stay. Dove Cottage used to be a real Dovecote though must have been a big one. Pretty stone cottage with a nice garden area at the back. Swimming pool was a bonus and kept the kids happy. Walks on the beach and in the hills were perfect and it is good for cycling too as the Wales coastal path (a lane at this point) runs next to the property. Graham is very helpful and welcoming too. Will certainly come back again. Dove cottage is in a breathtaking location, close to the sea, rolling hills and great for visiting the many narrow gauge railways, unfortunately the property, is in need of updating and a thorough clean. It was very dirty throughout and some of the furniture is in need of repair to make it useable. In particular the washing machine needs attention to remove the mild from inside. My young family cannot recommend this property but we can recommend the area. The French family shared with me in more detail the sources of their concern have now been fully addressed though we accept that they should have been right in the first place. We are always grateful for and act on constructive criticism as soon as we receive it. The property was completely stripped and refurbished 12 months ago.